A main focus of this particular online apologetics and discernment work here at Apprising Ministries, has been monitoring and exposing of the Emerging Church, now upgraded to 2.0 with its newer, more clearly delineated, postmodern Progressive Christian theology. This new, and not improved, liberal theology—a Liberalism 2.0—is what this sinfully ecumenical neo-liberal cult of the Emergent Church will often refer to as “big tent” Emergence Christianity. You’re likely aware of leaders within this EC—seeker driven for the “counter-culture”—movement like the Emerging Church trinity of apostates, Living Spiritual Teacher and EC guru Brian McLaren, universalist Emerging Church pastor Doug Pagitt, and his friend Tony Jones, the progressive “theologian in residence” at Solomon’s Porch. Having been embraced by spiritually obtuse evangelicals, vipers such as these have long been teaching counterfeit forms of Christianity to young mainstream evangelicals. As I said before thanks to FTS, for example, we’d been able to come to know that Doug Pagitt Points Us To Michael Dowd. You might recall I’ve explained that “Rev.” Michael Dowd is the evolutionary Pentecostal preacher who tries to teach us that the sinful nature is actually good, God is not a person, and the Bible is driving people away from him/her/it. I like what he’s up to…he’s written a book called, Thank God for Evolution and his argument is that there’s this big thing going on in the larger story of the cosmos and that it’s not at all inconsistent with Christianity; it’s not all inconsistent with the Hebrew faith, it’s not at all inconsistent with the other great faiths of the world. Like I brought out previously, he could quite literally say: “Hi, I’m Doug Pagitt; I’m a Christian, though I don’t believe virtually anything Christians believe.” This is further confirmed by Jeremy Bouma, whom I introduced you to in Dissention Growing Around The Emerging Church. You might remember I told you that Bouma had written a post where he said Goodbye Emergent: Why I’m Taking The Theology of the Emerging Church To Task. Pelagius and Pagitt agree that the example and pattern of Christ is primary for our “salvation” and “integration with the life of God,” they go about it in different ways. Pagitt denies the penal essence of the event of the cross by dismissing the suffering, bloodshed, and death of Christ as reflective of ancient Greek blood god myths. Pelagius on the other hand, acknowledges that Christ’s suffering, shed blood, and death actually does something for us. While a more exhaustive study of Pelagius’ soteriology is necessary, it appears likely that he believes the cross is penal in essence, recognizing Jesus’ suffering and bloodshed provides justification for, salvation from, and forgiveness of sins, while needing the example of Christ to carry us to the end. Pagitt’s theology of salvation reduces the cross to mere example. In fact, in so doing he is left only with the example, pattern, way, and teachings of Christ. This is likely why Pagitt and the broader Emerging Church focus on following the teachings and example of Jesus: without the penalty of the cross that is all that is left. Here is where Pagitt agrees with Pelagius: in order to live a life of righteousness, a new example and pattern must replace the old ones found in Adam and others. The cross does not save, but the example of Jesus does. While Pelagius believes the cross provides for the forgiveness of past sins through faith and “the holy lather” of baptism, Pelagius does not stop with faith alone, but rather requires disciplined following after the example of Christ to provide for future salvation. Both Pagitt and Pelagius, then, rely upon the example of Christ for ultimate, eschatological salvation, in addition to the inner goodness of humanity to obey and choose integration with God. Doug Pagitt, author and pastor in the emergent church movement, discussed his new book, Church in the Inventive Age, in “A Conversation on Theology and Culture,” an event held on Tuesday, October 19. Associate Professor of Church in Contemporary Culture Ryan Bolger hosted the event, which was sponsored by the Lowell W. Berry Center for Lifelong Learning and the Office of Alumni and Church Relations. 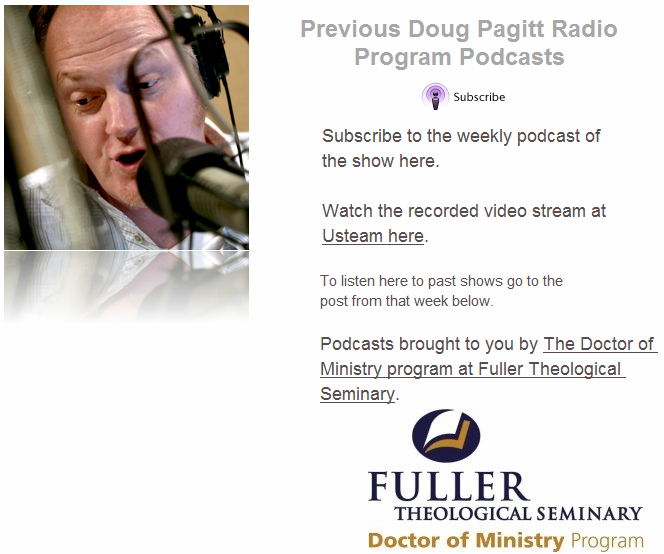 But we’ve seen already that Doug Pagitt is an apostate, at best, and isn’t teaching anything consistent with the historic orthodox faith, so the only way he could be considered “doing church” would be by mental off-roading into the postmodern Wonderland of Humpty Dumpty language. Pagitt has now dreamed something he calls “the inventive age”; however, what this actually turns out to be is an artificial category where we can just make stuff up about God and then pawn it off onto the Biblically illiterate. Again, what’s happening is Pagitt’s cobbled together in his spiritual basement his own version of Christianity; then he tells people that in his global Pagittianity the “community” decides what parts of it they want to “participate in.” Pretty neat, huh? Sola Scriptura’s shown the door, out goes the need for a pastor-teacher, and in comes something called “a community curator of spirituality.” Then as they practice the spurious spirituality of that “big thing going on in the larger story of the cosmos,” Pagitt mentions above, they’ll “manifest the gospel” of Pagittianity, which is a type of pagan universalism. Like I said before; I don’t know about you, but I’m really having a hard time understanding why any seminary that would claim to be Christian would sponsor and promote this terrible theology. But to put this into proper perspective for you; Fuller Theological Seminary is sponsoring and promoting, not Christianity, but pagan Pagittianity. From transcript in Universalism Is Too Small For Doug Pagitt. Doug Pagitt, A Christianity Worth Believing [San Francisco: Josey-Bass, 2008], 226.